The Labour party general election manifesto is one of the most read political documents of all time. 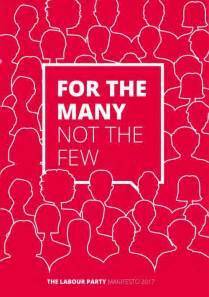 The document, entitled for the many, not the few has been incredibly well received by the public and sets out a platform for a brighter future for Britain. The party promises to renationalise the railways, increase the minimum wage, end NHS privatisation, properly fund our schools and put an end to tuition fees. The full document can be read here. This entry was posted in National Labour Policies on July 18, 2017 by Ashley Pearce.